Parisians gather and create memorials across the city to honor the victims of the November 13 attacks. PARIS, FRANCE—On Friday, November 13, Paris, France was struck with several terrorist attacks that have been recognized as “the worst terror attack to happen in Europe in 10 years,” with over 300 people wounded, and the body count being at least 130. President François Hollande issued a citywide curfew and declared a state of emergency as mass shootings took place at popular Parisian epicenters of crowded bars, restaurants, sports tournaments, and the famed Bataclan concert hall. The world watched the gruesome unfolding of the second terrorist attack to take place in Paris this year, as more explosions were detonated, and the body count rose higher and higher by the minute. 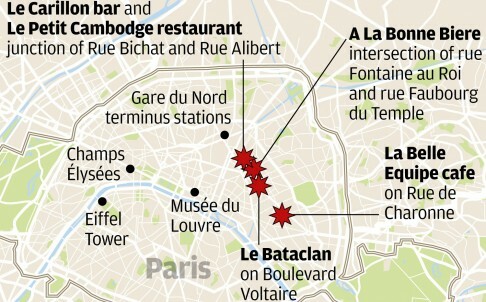 A map of the six ISIS-coordinated attacks that took place in Paris on November 13. On Saturday, November 14, the Islamic State claimed responsibility for the coordinated massacres, and proclaimed that the attacks were “the first of the storm.” The message was released in Arabic, English and French through the messaging platform, Telegram, and driven to the Islamic State’s Twitter page. 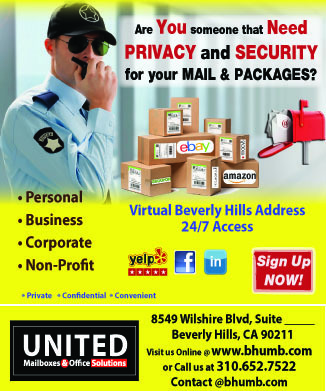 The activity was tracked by SITE Intelligence Group Enterprise, an organization that tracks Jihadist threats. The most fatal attack took place at Le Bataclan concert hall around 10:00 p.m., where 89 people were killed; some after being held hostage. The venue was at full capacity with 1,500 people in attendance for a sold out show of the Southern California-based band, Eagles of Death Metal. According to eyewitnesses in the theater, the shooters wore black, some could see that two of the three shooters’ faces were exposed. 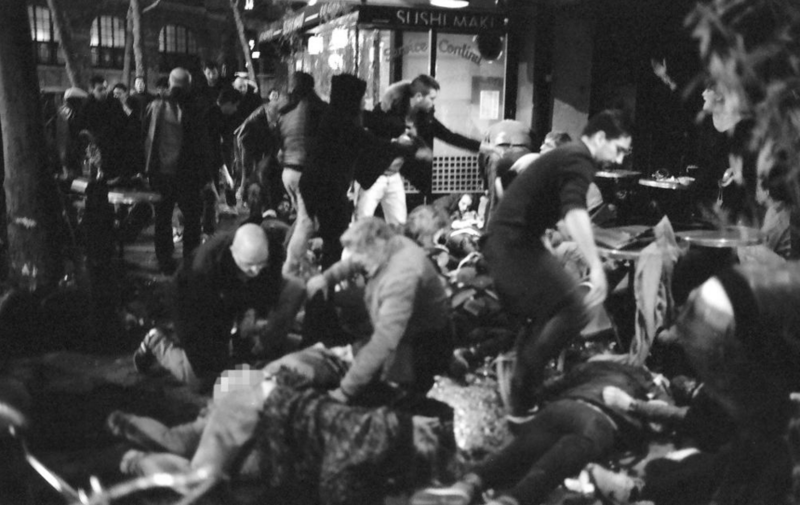 Witnesses stated that the attackers were throwing grenades, firing automatic weapons, shooting blindly into the crowd. “It was extremely violent and there was a wave of panic,” one of the witnesses stated, people were being trampled over, noted one witness. 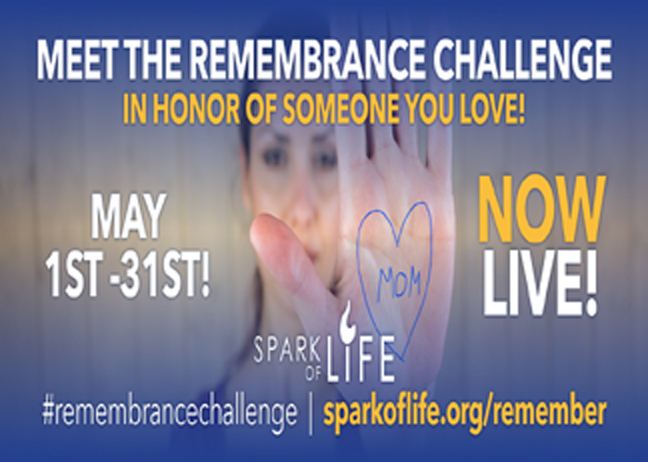 At approximately 9:38 p.m., a gunmen opened fire and killed 19 people who had been sitting outside the restaurant. In a photography feature published in The Guardian, Slovakian photographer Adrián Švec was having dinner with his girlfriend nearby, and was able to capture the events unfolding just three minutes after the attacks had started. According to Švec, 11 of the victims were a group of friends who worked at the Cafe des Anges, and had been out celebrating the birthday of one of their colleagues. The Guardian also reported that the wife of Gregory Reibenberg, owner of La Belle Equipe, had been killed in the attack. An image captured of La Belle Equipe attacks by Slovakian photographer Adrián Švec. According to French police, multiple gunmen were reported to have opened fire and killed at least a dozen people at the restaurant Le Petit Cambodge and neighboring bar, Le Carrillon, on Bichat and Fitzroy streets, located in the trendy “hipster” Canal Saint Martin area. Eyewitnesses reported the gunmen were shooting in bursts of three or four shots. Witnesses reported that the shooters had been in a car while firing at civilians. At the 80,000-person stadium of the French and German football match, three explosions were detonated and set off during the game. According to reports, no one aside from the bombers themselves had been killed in the explosions. According to French police, one of the attackers had a ticket to the game, but security guards discovered his suicide vest upon searching the attacker. Reports indicate that the vest was detonated around 15 minutes after the match had begun. A spectator’s footage of the game captured the sounds of the blasts, which initially caused confusion that there were fireworks being set off in the stadium. President François Hollande was in attendance at the match, and learned of the attacks unfolding in Paris from his bodyguard. Hollande was quickly escorted out of the stadium after the third blast. Without detailed explanation, a stadium announcement created panic among crowds when they were prompted to use certain exits due to events taking place outside. According to an eyewitness, a man dressed in black began firing short bursts from a machine gun. Five people were killed at this location. The owner of the Casa Nostra pizzeria, Dmitri Mohamadi, stated to the French publication, Le Figaro, that the shooting was less than a minute long. Mohamadi had taken an order and went into the kitchen for what he believed to be 30 seconds, and when he returned, the shooting had already taken place. At approximately 9:40 p.m., a terrorist identified as Ibrahim Abdeslam, set off a suicide vest inside Comptoir Voltaire, a cafe on Boulevarde Voltaire. Reports indicate that Abdeslam had an abandoned vehicle containing three assault rifles, and several magazines of ammunition. Authorities have determined that Abdeslam was the only person that has been reported as dead from this attack site. 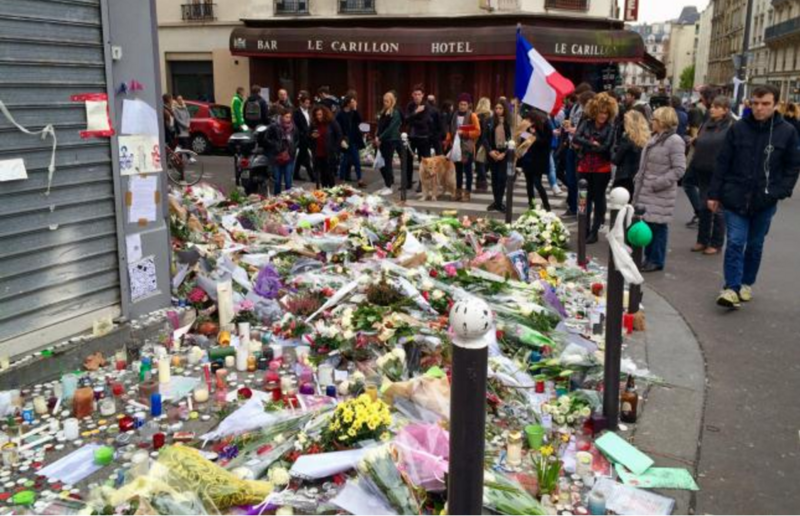 President Hollande declared a three-day mourning period following the attacks. Schools, businesses, museums, and all major monuments were closed. The Eiffel Tower was announced to be closed indefinitely, and the monument’s lights were turned off as the world learned of the attacks. Police prohibited public demonstrations and large gatherings. All French borders were reinforced with security. International monuments publicly showed their support by illuminating prominent monuments with the colors of the French flag as a message of solidarity. 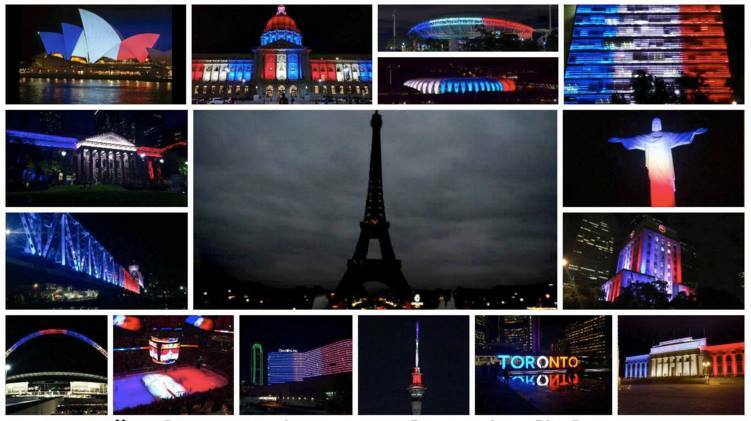 Monuments around the world light up to show solidarity after the terrorist attacks take place in Paris on November 13, 2015. On November 15, the Notre Dame cathedral re-opened to hold a memorial service for the victims. A public memorial gathering also took place at Place de la Republique. Hundreds of mourners came together to lay flowers, pictures, hold candle-lighting vigils, and come as a city united by their loss. On Saturday, November 14, after ISIS claimed responsibility for the Paris attacks, Belgian-born French national Salah Abdeslam was identified as the eight perpetrator of the deadly attacks in Paris. Abdeslam has been described by authorities as a 26-year-old man, 5 feet 7 inches tall. In an alert on Twitter, French National police officers identified Abdeslam as “dangerous” and urged civilians not to interact with him. Abdeslam and two men were stopped by the French police at the France-Belgian border, and confronted by police several times for questioning. After presenting identification, the men passed through and Abdesalam is now on the run from authorities. Abdesalam is believed to be in the Molenbleek neighborhood of Brussels; a well-known area for jihadi activity. 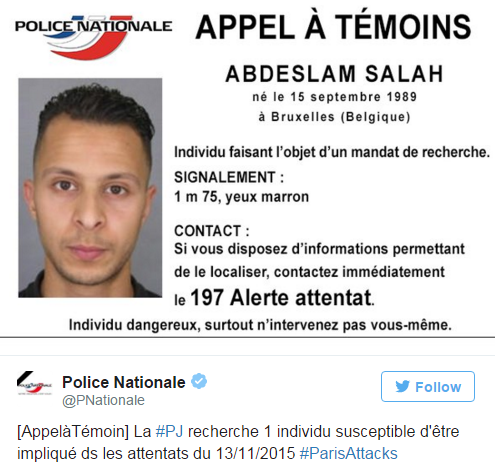 A tweet released of Abdeslam Salah by the French National Police, urging civilians to contact authorities if spotted. On Sunday, November 15, the French military launched airstrikes with 10 fighter jets sent to Syria to bomb ISIS headquarters in the city of Raqqa. According to the Defence Ministry, 20 bombs were dropped, destroying an ISIS’ training camp and command post. On Monday, November 16, French investigators announced Abdelhamid Abaaoud, a Belgian national and member of the Islamic State, to be the mastermind behind the Parisian attacks. French and Belgian authorities began to raid the homes of suspected terrorists, which led them to the quiet Parisian suburb of Saint-Denis. Police found two suspects hiding in an apartment complex, and a seven-hour standoff ensued. Seven suspects were arrested as a result, and two suspects were killed, including a woman who ended her own life by detonated a suicide vest.